Diamond Details: 60 Round brilliant cut white diamonds, of excellent cut and brilliance, weighing .65 carat total. Gemstone Details: 2 Honeycomb cushion cut green tourmaline, of exquisite color, weighing 5.78 carats total with 56 round cut yellow sapphires, of exquisite color, weighing .45 carat. 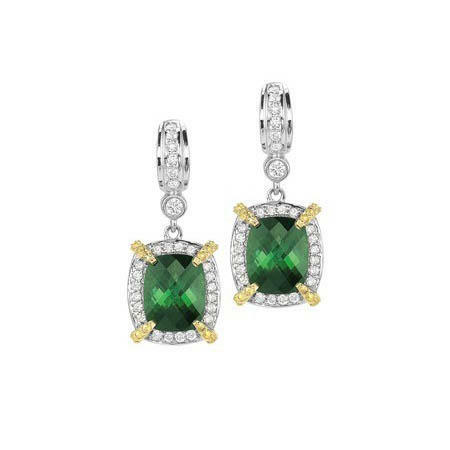 This gorgeous pair of 18k white and yellow gold earrings, designed by Charles Krypell, contain 2 honeycomb cushion cut green tourmalines of exquisite color, weighing 5.78 carats total with 56 round cut yellow sapphires, of exquisite color, weighing .45 carat total and 60 round brilliant cut white diamonds of excellent cut, quality, and brilliance, weighing .65 carat total.